If you think that having a Gmail fax number means you need a dedicated fax line then you’re wrong. But being wrong is a good thing because now you can use the alternative solution that saves you time and money. This article will give you further insight on how a dedicated fax line works, what your options are and which is the smarter choice. What is a dedicated fax line? Many businesses decide to get a phone line that will be solely dedicated to their fax machine because it avoids voice call interruptions. While you could plug-in your machine directly to a phone line, this means that both your fax and phone are sharing the same line but cannot be used at the same time. The cost of having a dedicated line varies from each phone company. You will be charged their fee for having a second line and also for the fax calls made, these fees vary from each company so be sure to check with yours to make sure you don’t get a hefty phone bill. Another solution many people use is Magic Jack, which can cost around $60 and it’s a VoIP phone service. Basically it’s a USB that you can connect to your computer to be able to make phone calls, but it can also be used to fax from your computer. There are mixed reviews as to how well this method works, but here is a quick video that explains how to get it set up. 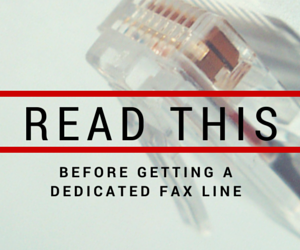 Overall, getting a dedicated fax line is no easy task. If you’re business is sending a considerable amount of faxes each month then you need a solution that is fast and easy to set up, without having to buy extra hardware or pay installation fees. That’s the smartest way to get it done today. Using your computer and the internet gives you an instant virtual fax machine that is incredibly easy to set up. This isn’t the same thing as using Magic Jack or VoIP, instead the hero in this scenario is an online fax service. Online fax services use the internet to give you a dedicated fax number that will not interrupt your phone line. If you want to avoid a land line completely then many services offer a phone and fax solution that you could also use. Setting up an online fax service doesn’t require any technical knowledge. Your part is just filling out the form to sign up online and picking your fax number. Once you are finished you receive an email with your account details and you can immediately begin sending and receiving faxes. An online fax number is no different from a regular fax number issued by a phone company. The format of the number is the same and anyone can send you a fax, whether they use a fax machine or their computer. The only difference is that you will be able to send and receive faxes through the internet, no matter what computer you use or where you are, as long as you have an internet connection you have access to your faxes. With the popularity of Gmail many are calling this a google fax number, although it is not given directly from Google it can be integrated with your Gmail and many other web mails, including Microsoft Outlook. If you already have a fax number that you want to keep then you can also do this, it’s called propagating your fax number and many providers will be able to get this done for you so you can continue to use your current number with their service.